Princess Tori in Blue. My creation on Adobe Photoshop CS5, I set the hue and saturation on the pink parts. This fan art was requested by Cynti19. Hope you all like it too ;). 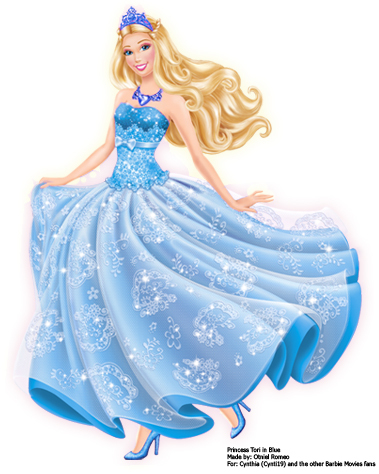 Wallpaper and background images in the Barbie Movies club tagged: barbie princess tori in blue popstar. This Barbie Movies fan art might contain gown, dinner dress, dinner gown, formal, evening gown, bridal gown, wedding gown, and wedding dress. I know this kind of fan art is already here. But Cynthia (Cynti19) requested it from me, so I made it. Very beautiful! She looks stunning in blue! Thank you Vitty & Sirea! How do you make it?? I want to make my photos like this!! !